For all the people who grew up with Doraemon, this model kit from Bandai Hobby is a must have! Doraemon's secret Time machine gadget that he often uses comes in a set complete with a static Nobita figure! Attach your Doraemon and Dorami figures (sold separately) to make the most of this adorable gadget! Utilizing clear parts and movable levers add more play value and realism. The internal mechanics of the cockpit have been carefully recreated and can be seen even after assembly by just lifting the cover. 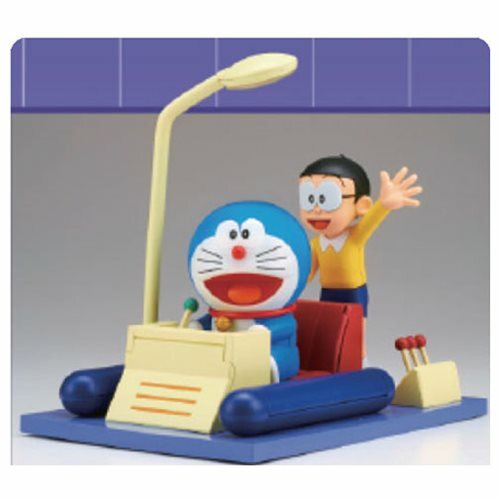 The Doraemon Time Machine Secret Gadget of Doraemon Figure-Rise Mechanics Model Kit includes 1x Nobita figure, 1x seat, 9x Runners, 1x Sticker sheet, and 1x Instruction manual. Measures about 5-inches tall.